Plyometrics have long been considered a key in developing explosiveness, quickness and speed. Such explosiveness is referred to as “Strength in Motion”. Plyometric training links together strength with speed to create power. It’s essential to athletes, primarily to those who run, jump, lift or throw. Plyometric training is designed to enable a muscle to reach maximum strength in a short amount of time. 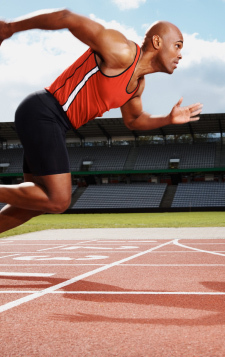 This in turn leads to muscles that propel athletes faster, higher and more explosive. Our patented and proven Springbak Springsoles will give you a competitive advantage as well. The Springsoles will give you a longer stride length, and quicker stride frequency, both necessary to gain speed. Together with plyometric training, this is the combination winning athletes are using today. Each type of jump is useful for developing explosiveness in all sports. Add the use of barriers such as cones and hurdles to increase training variety and intensity. Also, add a 5-10 yard sprint after each jump, or the use of a ball (catching, dribbling) to make it more sports specific. Be creative, follow your impulse, and listen to your body. Good Luck!